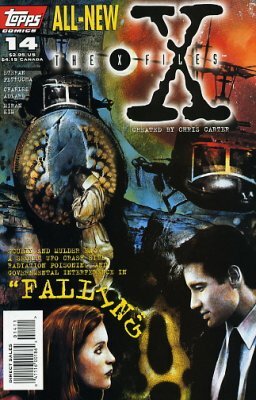 As we move in to the conclusion of the first year of Topps' X-Files comic series, I can clearly see the behind the scenes conflict that seemingly plagued this book coming into play in the form of a sudden shift and swift retcon of the overarching story being that of a government conspiracy to one of a single person being behind EVERYTHING that has happened in the first 9 issues. From interviews I've read, the writer claims that the T.V. production company kept such an iron grip on the comics that it let not only to a disruptive shipping schedule due to their approval process. . .where the book would skip months, then ship THREE issues in a single month. . .but also to the departure of the original writer in favor of someone the T.V. producers could more easily work with (Read: Tell what to do and how to do it). But enough of the background drama. 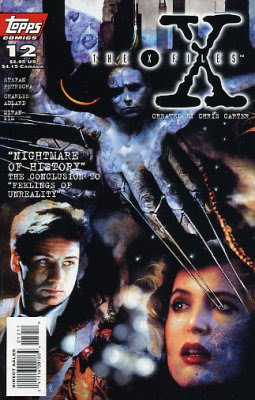 We've got 11 issues of X-Files to look at. Let's do this! Agents Mulder And Scully investigate a mysterious string of deaths that surround a bone fragment that may possibly be from "Eve", the earliest known human ancestor. I'm not sure if Topps understood the concept of an "Annual" or not. This double size issue came out in August alongside issue 8 of the regular series. The story starts out pretty interesting, but the resolution is a practically unreadable mess, with a crappy combo platter of deus ex machina and coincidence. On the other hand, artwise this is one of Adlard's better issues so far. He still doesn't really capture the look of Scully and Mulder, but there are some really nice panels in this one. Overall this annual swings wildly from pretty good to "What the F%CK?" 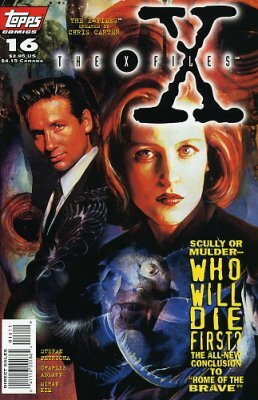 The threads of conspiracy from the previous 9 issues begin to come together in this 3 part story as Scully and Mulder follow separate trails of clues that seem to be heading in different directions toward the same destination. So here we are at the wrap up of the first year of X-Files and it's actually pretty good, compared to some of the crap-tastic issues that came before. It really feels more like an episode of the T.V. show. Even better, it seems Adlard FINALLY got a bit of a handle on the main characters. The art shows a big improvement even over the previous issue. Is it too much to hope that X-Files is beginning to shape up into a series that can actually be good? Mulder and Scully undertake separate explorations of the mind. . .Scully via science, Mulder via an ancient crystal helmet. . .and discover that there's more to the Aquarius Conspiracy than either of them thought. This middle issue of the 3 part Aquarius Conspiracy wrap up returns to form as a bit of a muddled mess. To tell the truth, it doesn't really make much sense and just seems to be groping for a way to make all the previous issues tie in to each other. Worse, Adlard's art swings back toward okay/ borderline bad. All in all, not a good issue. 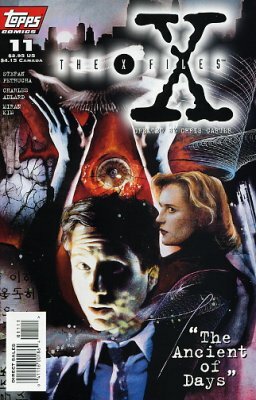 Scully and Mulder discover that the Aqarius Conspiracy is actually the work of a single person. . .a survivor of secret government mind control experiments (from issue #2) who gained unexpected mental powers and the the ability to control minds and memories. 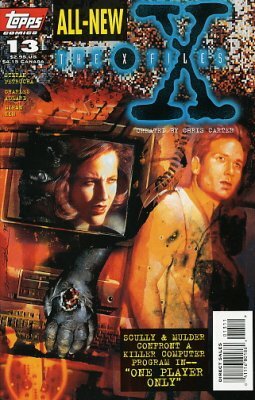 And here we are at the end of the first year of X-Files, where we discover that the Aquarius Conspiracy never existed and everything that has happened has been because of an old woman who was overwhelmed by the mental powers she gained as a result of the secret government experiments from 1948 from issue #2 and her efforts to be rid of them. Oooooookay. Well. . .that was. . .sort of interesting, in a "What the Fu#k?" kind of way. I'll give it this. It's pretty obvious on a second reading of the previous issues that the Aquarius Conspiracy was supposed to be a bit more of a traditional "Deep Government" thing than the mental mindfu#k it ended up as. . .so credit to the writer for the 3 issue swerve from the original direction. I'm guessing that the creative interference from the X-Files T.V. producers I've read about had something to do with the swerve. . .unfortunately, in attempting to un-attach the comics from a similar deep government conspiracy arc to what was happening on the show, the writer REALLY had to stretch and jump through hoops. The jumping and stretching needed to fit EVERYTHING from the first 9 issues AND change direction made the ending of the Aquarius Conspiracy storyline a muddled, almost unreadable mess. 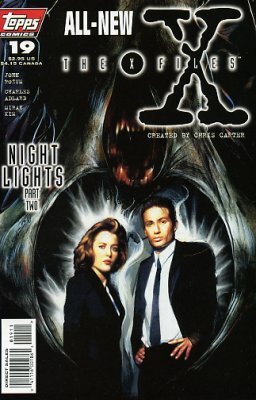 Scully and Mulder investigate a murder committed by a computer programmer and have to decide if it's possible for artificial intelligence to force a man to kill. A one-shot story that looks into the state of A.I. at the dawn of the internet age. It's interesting to take a look back 20 years with a story that hinges on the strange sounds the killer makes in custody being modem noises and realize that things have actually gotten quite a bit more terrifying since then. The art in this one is a bit unusual as cover artist Miran Kim shares the interior with Adlard. . .illustrating things from the computer's point of view. Unfortunately, her fantastic cover work doesn't translate well to interior story pages. As Mulder lays dying in the woods from radiation poisoning, Scully tries to discover the truth about a UFO crash. Another one shot story where Mulder almost dies trying to find truth that may or may not be real. Is the crashed object an experimental plane or a UFO? It's never revealed which. I liked the ending, but getting there was a bit of a drudge. 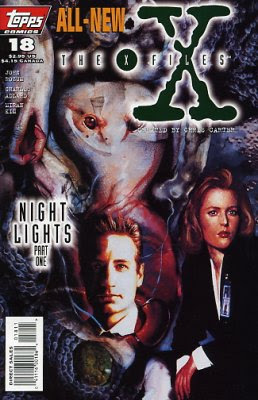 As of this issue, X-Files switches to a less glossy paper and computer coloring by Digital Chameleon. Both seem to greatly improve Adlard's art, even though he still has trouble capturing the likeness of the main characters. Overall, not a bad issue. Not great, but not bad. 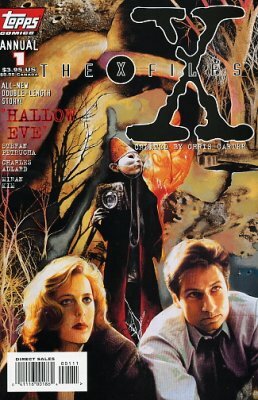 Scully and Mulder are captured by a Neo-Nazi apocalypse survival cult in the Georgia swamps while trying to track down a reported UFO sighting. But what's more dangerous. . .the cult or whatever is out there in the woods? Told mostly from the perspective of Aida, the mail order bride of one of the cultists, this story focuses less on the unexplained and more on the paranoia and cruelty of the group that's holding Scully and Mulder prisoner. I found it to be pretty good and could easily see this one being an episode of the T.V. show. Adlard's art continues to evolve as well, with this issue probably being his best. . .which is a damn shame because after the next issue, he's no longer the regular artist and only occasionally returns to the title. Agents Scully and Mulder escape their captors with the help of an abused wife who also wants to leave the cult, but as they are pursued through the woods, they encounter the unexplainable. . . The final issue by the original creative team is a bit of a mess. . .there are several gaping plot holes, including Mulder shrugging off an alien abduction that occurs RIGHT IN FRONT OF HIM! Adlard's art continues to improve and I can definitely see some of his Walking Dead style in this issue. . .too bad it had to come 16 issues in and on his last issue as regular artist. A pilot who disappeared in the Bermuda Triangle returns 50 years later, but his story doesn't sound quite right to agents Mulder and Scully. This first issue by a new creative team, focusing on the Bermuda Triangle mystery of vanished Flight 19 falls somewhat flat, but it's not bad. 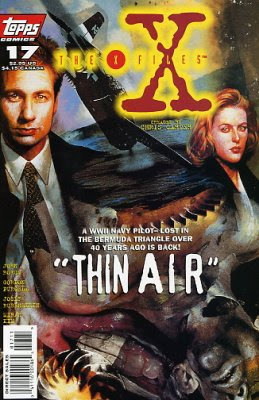 I like that there is quite a bit of attention paid to Scully and Mulder actually investigating and following clues as they discover that the pilot is actually an imposter. . .but that there's a REASON for the deception, that being to cover up the REAL re-appearance of Flight 19 pilots, if they should happen to escape the prison where the government is holding them. The art, on the other hand. No Bueno. I have to admit that the new art team captures the likeness of Scully better, but other than that, it's utterly average 90's comic art with absolutely no ambition. I can see now that Adlard's art REALLY wasn't that bad when compared. Adlard was uneven, but at least he had a unique style. The new art has no personality at all. Scully and Mulder investigate the mysterious disappearance of a team of scientists who may have possibly discovered a new life form. Adlard returns to illustrate this 2 parter and he does a fine job, compared to the crap-tastic art on the previous issue. The story, which delves into the mystery behind ball lightning and the theory that it may actually be alive, isn't really that interesting and seems to be a bit of a stretch. As Mulder and Scully try to find the truth behind the strange disappearance of a team of scientists, they have to contend with a hostile Sheriff. The ending to this story is a bit of a mess as the local Sheriff suddenly turns into a laughable villain. This issue also features the Lone Gunmen in a pretty lengthy exposition dump on the theory of unknown atmospheric life forms that bogs things down. Overall, this 2 parter was pretty weak. 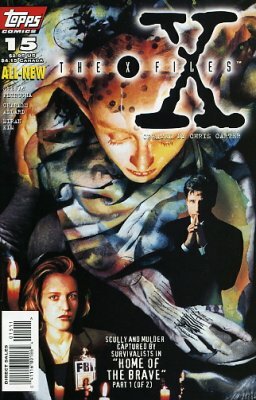 It's pretty clear to see that The X-Files was a comic series with conflict going on behind the scenes. In the shadow of a hugely-popular T.V. show, there were some pretty high expectations. Unfortunately, at the same time, the restrictions placed on the creative team by the T.V. show's production company made it almost impossible for The X-Files to succeed beyond the built in audience of fans of the show. For new readers there was nothing to introduce them to the characters. . .for existing fans there was no expansion on the show's mythology. Looking back from 20 years down the road, it's clear that the X-Files comics were doomed to fail. More X-Files. Issues 20-30 and Annual #2. This series was never really on solid footing to begin with, but with these issues things start to slide downhill fast.